Hi everyone! I feel like its been forever since I did a polka dot design, so I thought I'd give it a bit of a boost. I started off with two coats of Salon Perfect Bellini, and two coats of Salon Perfect Mint Julep on my ring fingers. I followed with one coat of SV. I used one of my larger dotting tools to create my polka dot pattern. I placed a bright blue glequin on the lower side of each dot before the dots had dried completely. I finished with one coat of SV. I really like the end result. It's a fun spin on a traditional look, and I love the way these two shades work together. This nail art is so cute! It remembers me the 70's! What fun dots! I really like the colors together. It reminds me of the eye of a peacock feather. I like your choice of colors. I love this! 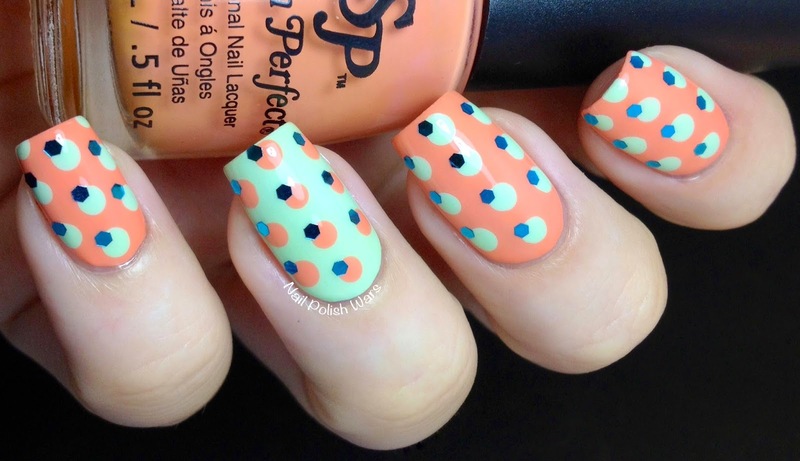 Nice twist to the "regular" dotted manicure!